the cozy birdhouse: mae-rry christmas! Mae was a little worried that Santa wouldn't know to deliver her presents to Grandma's house. When she met him at day care last month, she made sure to give him detailed directions. 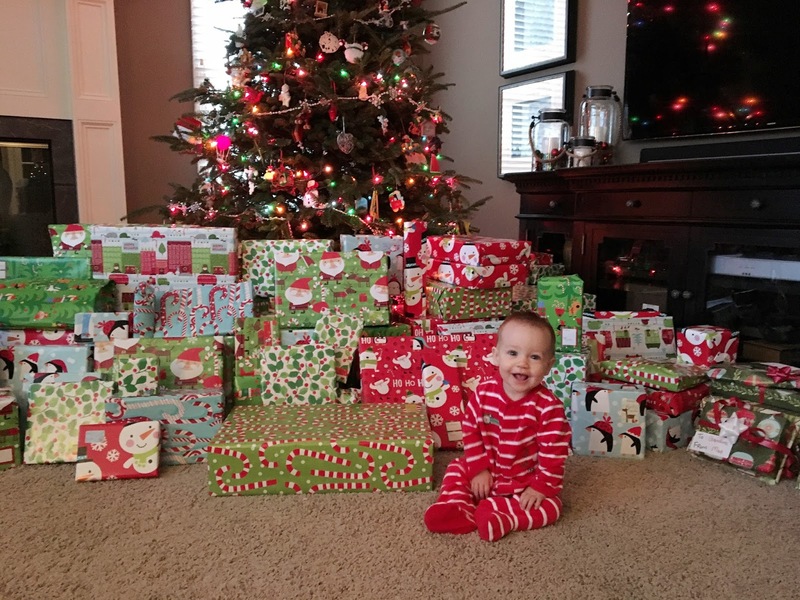 She also asked him for a mountain of presents. I think he went a little overboard. Just kidding, that was for my whole family. Here's her little pile! She has already tried out her new mini-piano and stacking rings. 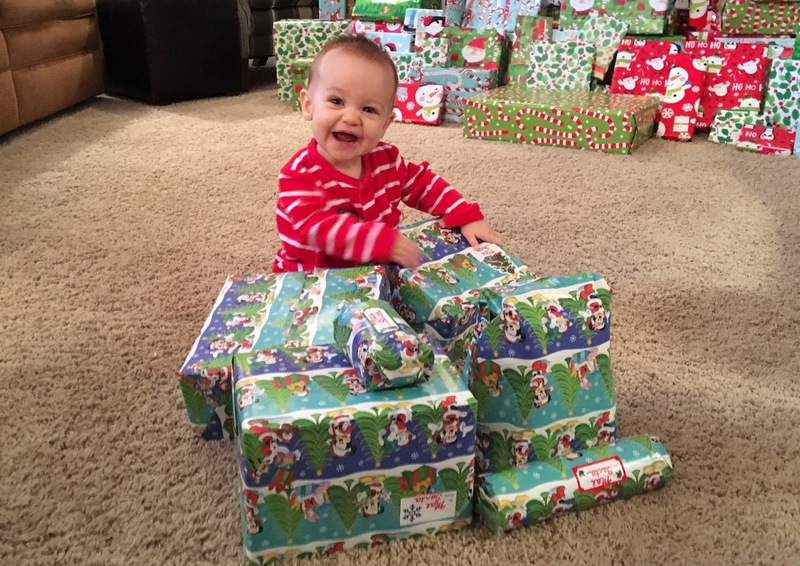 She and Oliver had so much fun celebrating their first Christmas! Before Christmas, we continued one of my favorite traditions of going to dinner and the Christmas show at the symphony. Mae stayed at home with my Aunt Ruthann, so Dan and I could enjoy an evening of grown-up fun! We switched up our Christmas Eve routine a bit this year. Instead of going to Mass at midnight, we went at 4pm and my parents hosted their Christmas Eve party for friends and neighbors afterwards. Then Mae got her very own copy of "'Twas the Night Before Christmas," which we read before she went to sleep. I wonder what Mae's favorite traditions will be as she grows up. I feel a huge responsibility to choose the activities that she will feel nostalgic for in 30 years! Finally, here's some cute Christmas-themed art that Mae created at day care. 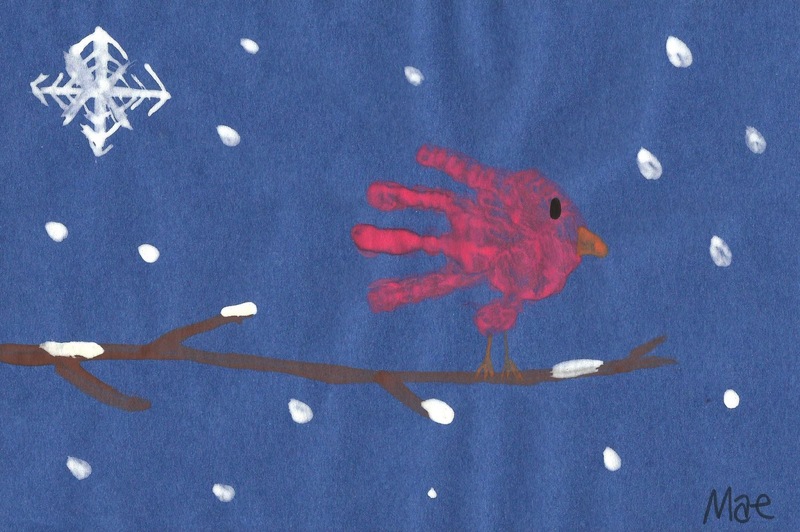 I particularly love the hand print bird (of course)! A lovely Christmas season to all of you! Merry Christmas to you also! I love when Mae comes home with handprint cards. I can tell when she has made one, because I will find bits of paint in her toenails or fingernails :-D Your angel card sounds wonderful... I bet the priest loved it!